Ik, nice looks just like the original just not dry rotted and painted. 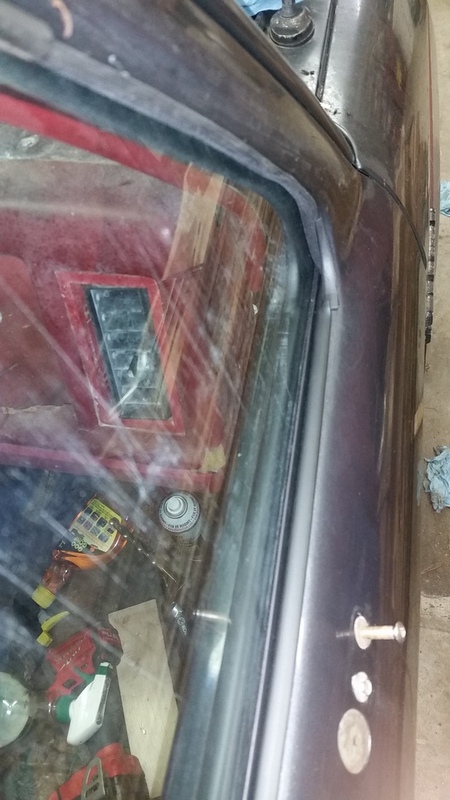 Looks like I'll order a set and some panel epoxy get this thing sealed up and windshield replaced. I don't know anyone that sells it new, this is off a second generation from the JY. You talking the 89-92 or 93-97? My trim is off a 89-92. Gotcha, that's how i thought but WIKI had it as 83-92 1st gen and 93-11 2nd. ill keep an eye out at the JY then. It is kind of fuzzy because it was a constant evolution, the closest thing to a clean slate was in '93 and more so in '98. Well continued the door rebuilds, I was able to clean the lock and lube it so it works as it should now not all gummed up. Then re-riveted the door passanger door handle as it was loose. Went to the driver side but realized it was loose because its broke so ill have to order new handles and just do both sides. Then i started into the window weather seals and after they were in the window groove it actually seals up well. Gonna need to get a new passanger window as the replacement i got was apparently a mud truck and scratched beyond acceptable but it is working to set the seal for now. And since my fan clutch was locked up I removed it and am adding an E-fan. 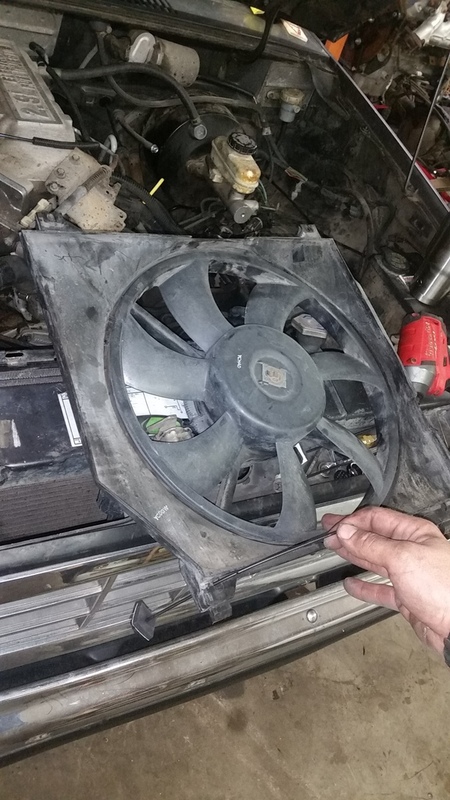 Turns out a Hyundia Santa Fe one speed fan fits almost perfect. 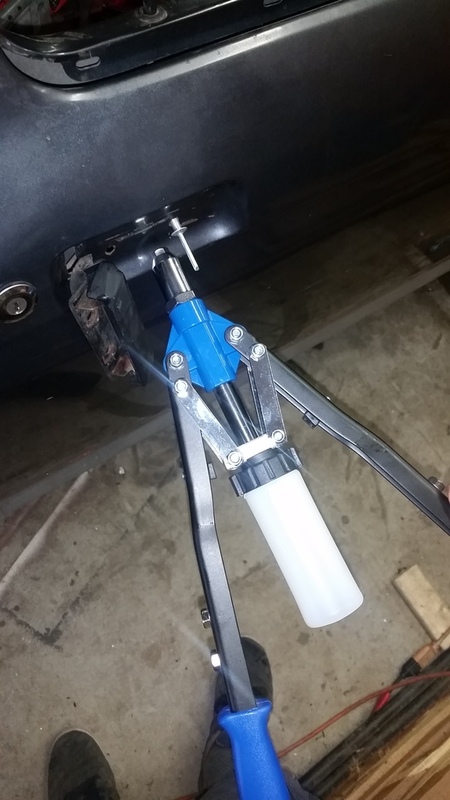 I just had to redrill the top holes to relocate the blind nuts and the lower just used some radiator fan zip ties. hope it gives enough airflow, Ill report later. Well need to update the wheels, so I got some Lexus is250 wheels pretty cheap 17x8 +45. It'll look pretty good once lowered and installed. Thinking of powider coating them a dark bronze. Now the rear should fit pretty good once my 1.5" hubcentric spacers come in, but the front hub is too big to fit the 60.1mm wheel center. 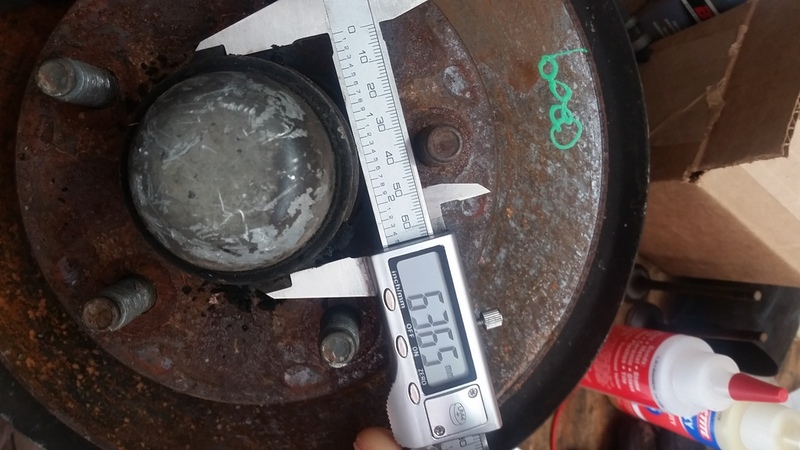 But since the front hub outer lip is 60.4 and the rest of the hub 63.65, I have a small lathe that I can turn the 10" hubs down the 1.7xmm to fit and become the hubcentric spacer. Hoping to get some time to do that tomorrow. 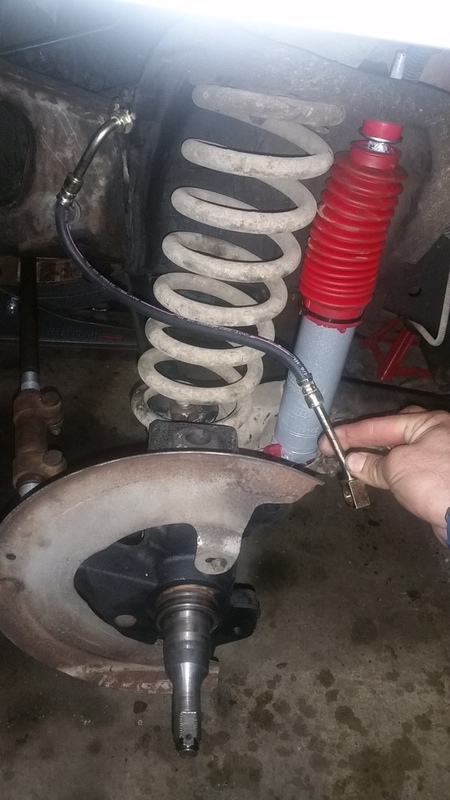 Well I dont get much time to work on it during the week but last weekend i finished out by trying to replace the door hold spring as the oem was long ago broke. 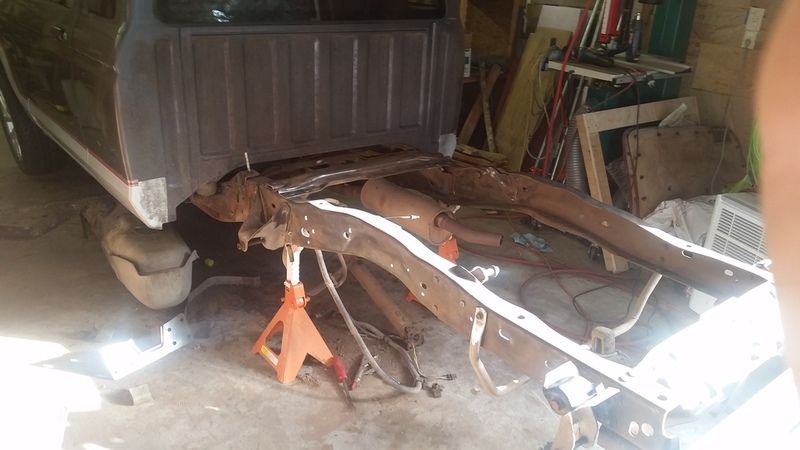 Didnt realize it was going to take ripping half the truck apart to get to it and realigning the door. 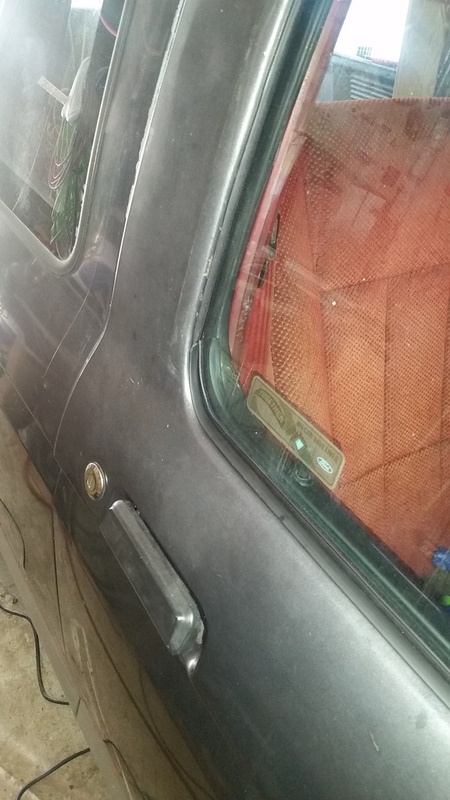 But got it done and replaced all the window seals and riveted the window back in. Amazing how new seals make it feel like a new door. 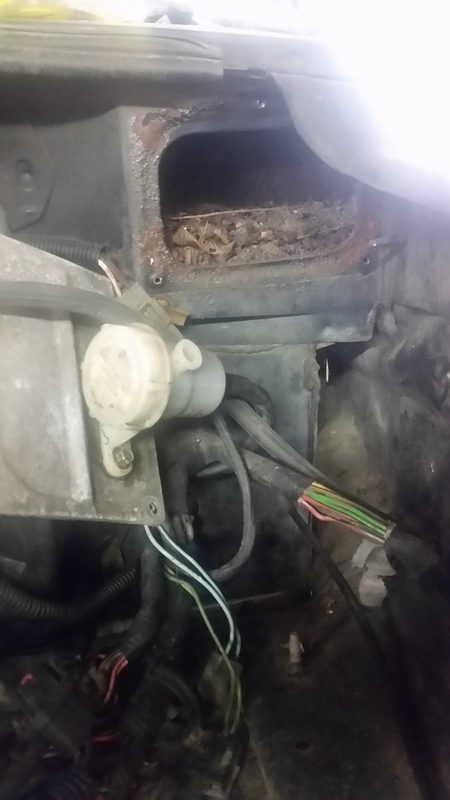 While i was in there i saw how filled with crap the fresh air vent was i vacuumed that out. Think ill clean it up some more later and apply seam sealer to some of the seams in there too. 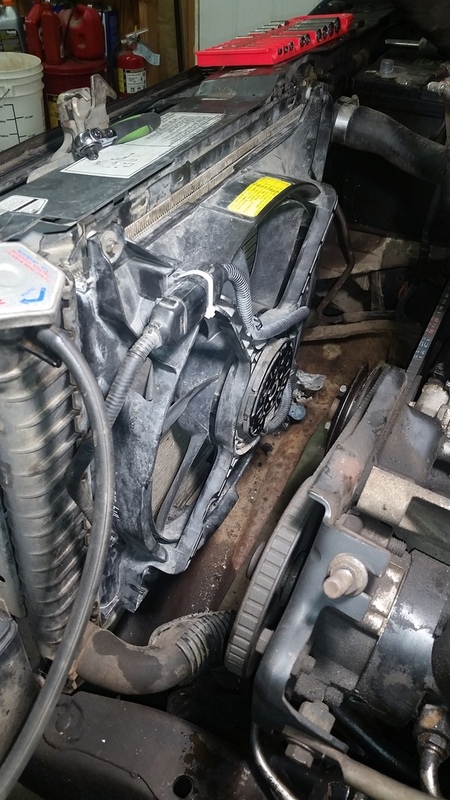 And finished by trying to swap out the power steering gearbox with the manual one i picked up, however thats when i found the manual box has a different pitman arm and is no longer made. I ordered a Vega 1" 36 spline one on accident and it didnt fit obviously. 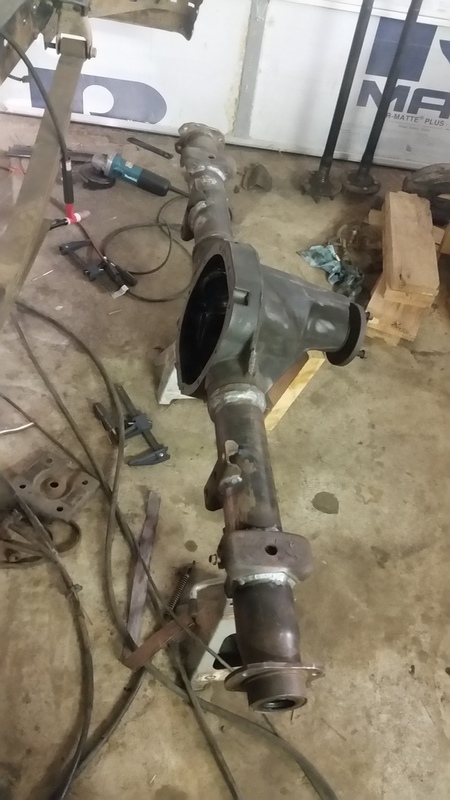 I thought i was ordering the Saginaw 525 pitman arm which should fit as it is supposed to have the same taper, so im waiting on the new pitman arm to come in. And during that i found why the steering wheel have a half a rotation before engagment. 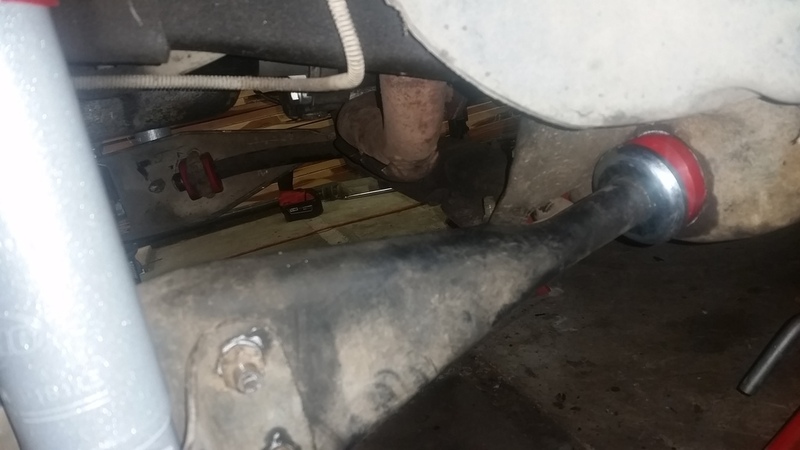 The center tie rod that bolts to the pitman arm was completely gone. 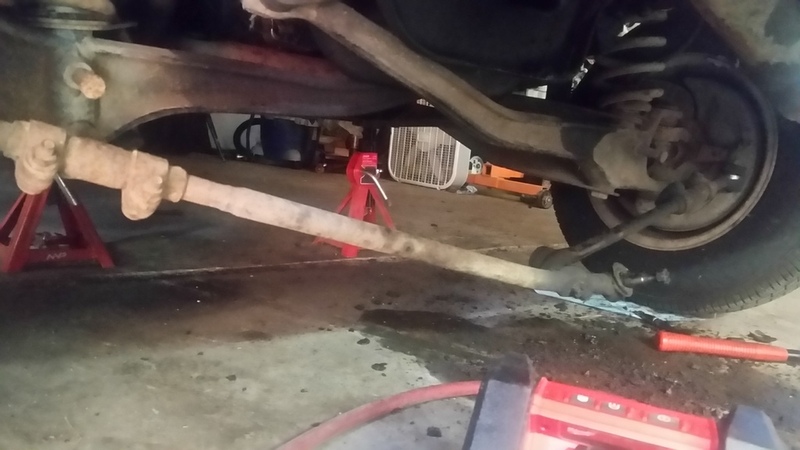 so ordered all new tie rods to be done with it. And this weekend I had a friend come over and help me rip the bed off the truck. 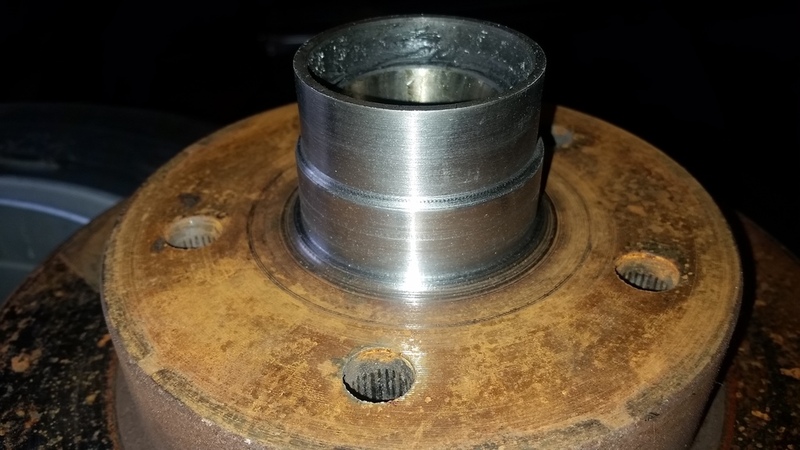 Only broke 2 nut plates and had to grind off one bolt head. 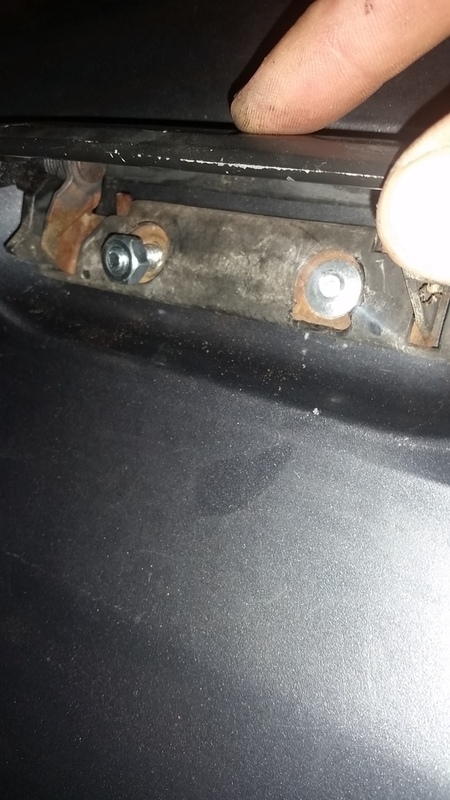 THose are $15 bolts and $10 nutplates BTW!!! 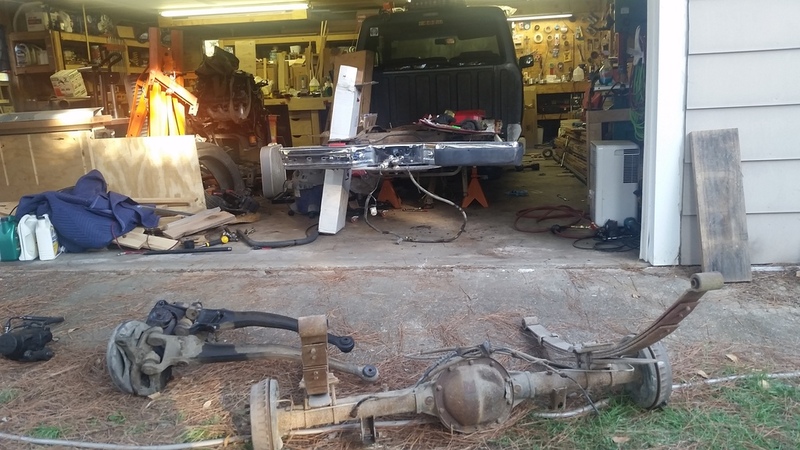 As well as rip out the old 7.5 to make room for my 8.8 after i cut it down. 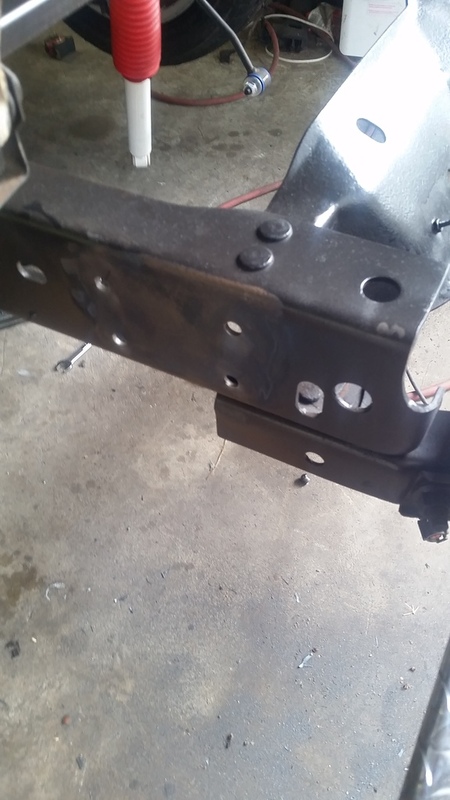 We were going to box the rear frame and c-notch it but i didnt have enough plate to do both sides. 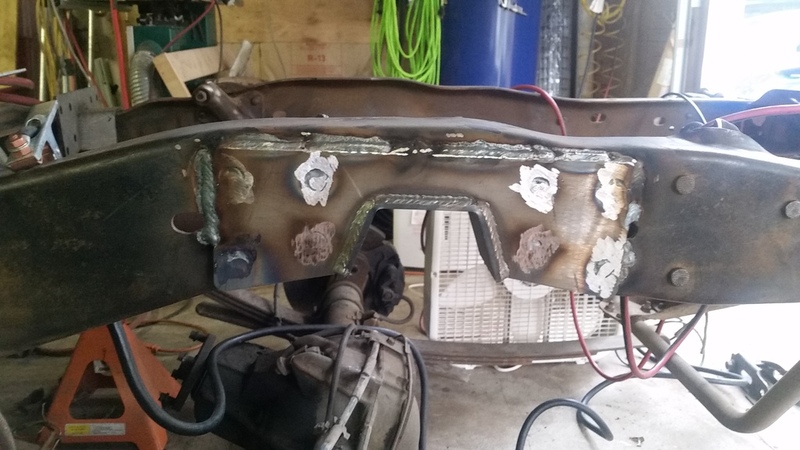 So i think what ill do there is get a bolt in set and use the plate i have to box in the inner side and weld it all in rather than bolt it. 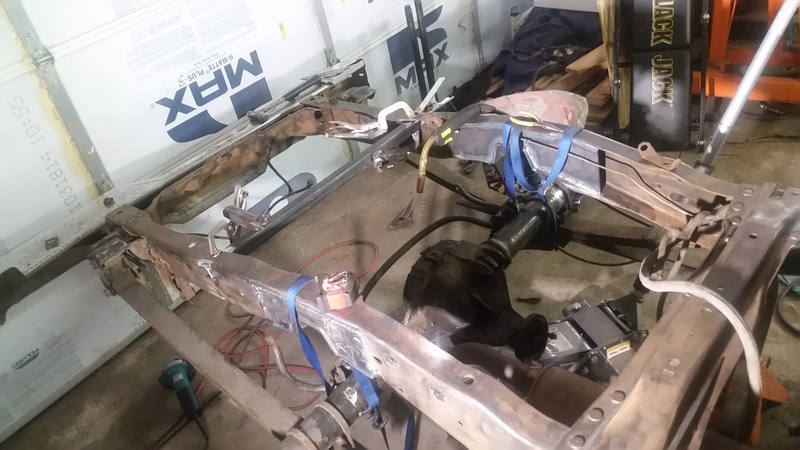 THen we moved to the front to rip out the early model I beam setup to get ready for the 96' i beam, knuckle, rotor, caliper setup ill be running. 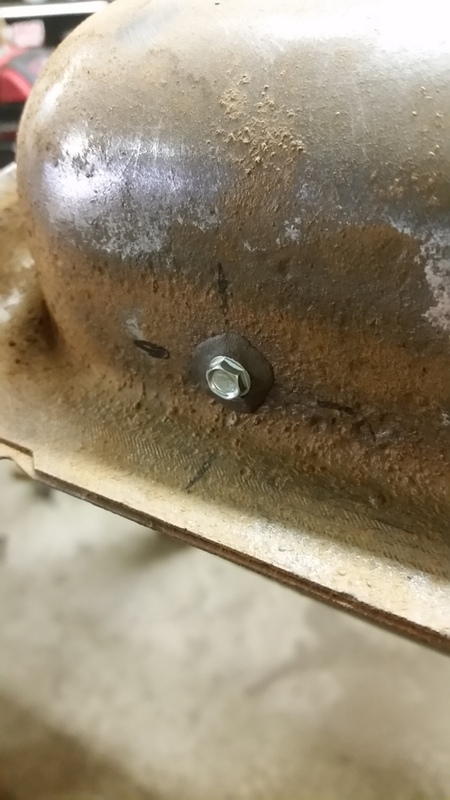 It wasent too bad except the last spring perch bolt on the passanger side would not come out.... ended up needing to use my 20T press to get it out. 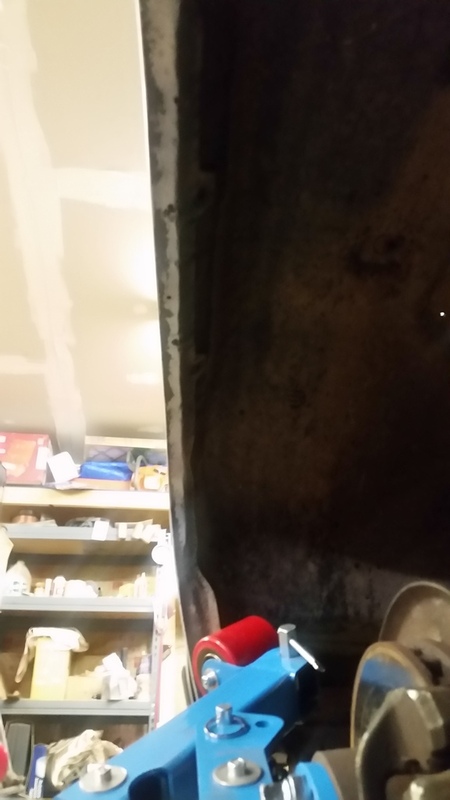 The bolt was fine just super tight in the I beam. Need to order the spring perch isolators for it as they fell apart and thats where we left it saturday. More to come sunday! 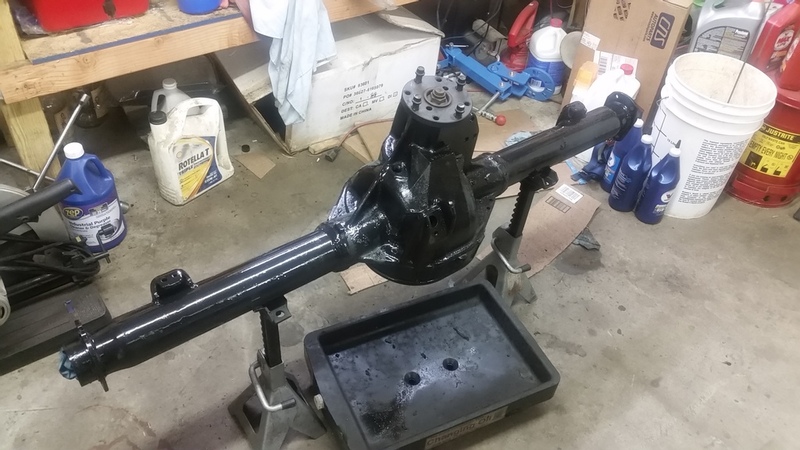 Ok so after a little back and forth research and wrong part shipping I have the steering put back together using a universal saginaw 525 arm that I tapered to the ford 7deg end with a speedway motors ream. the original hole I overreamed since i didnt measure when i should have so it got redrilled and reamed correctly farther down the arm. 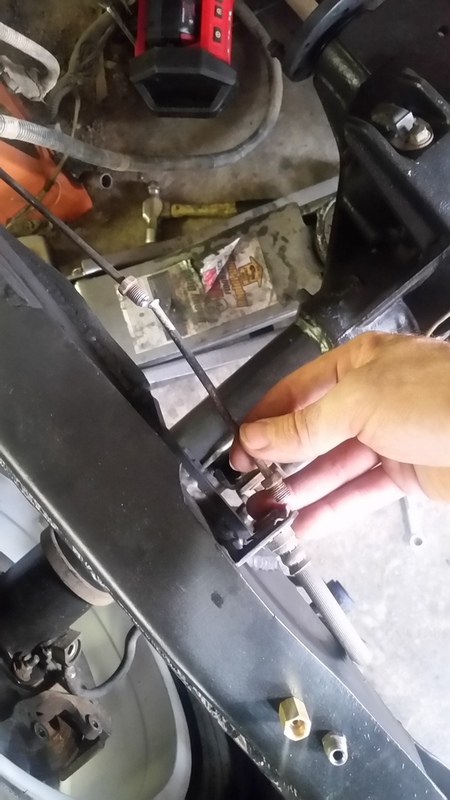 This leaves it right about where the OEM power steering pitman arm is in length. good enough for now till i determine if its fast enough and light enough to extend it later on. 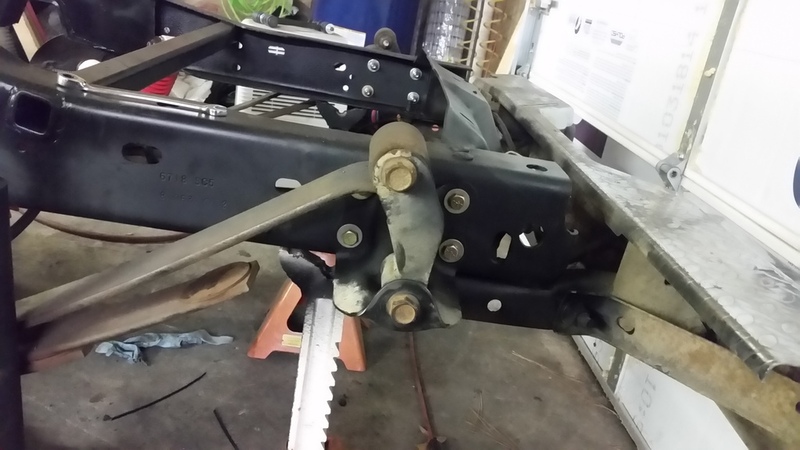 Still need to align when my 4deg adjustment cams come in as the 2 deg just isnt enough. 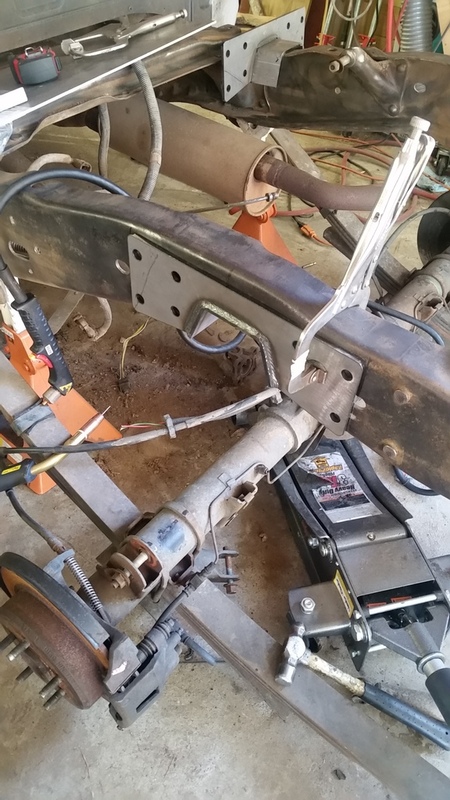 When doing this I installed my DJM lowering I-beams and all new bushings and spacers for the front suspension and sway bar. 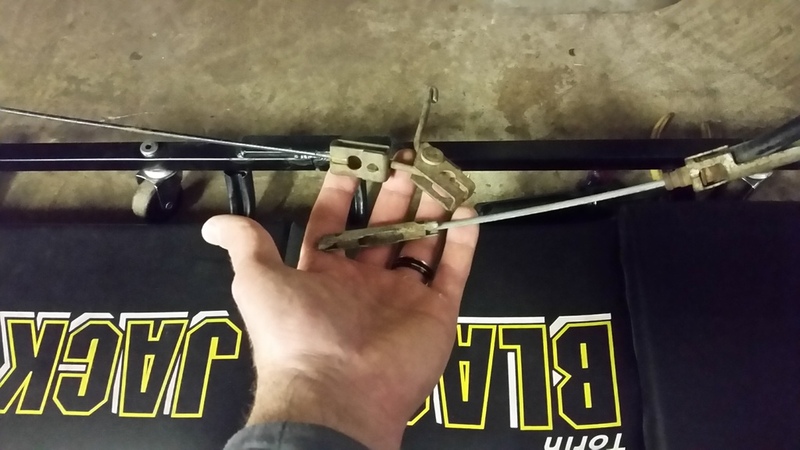 I also discovered the single piston caliper brake hoses are NOT the same and needed to get the brake hoses from a 4-wheel ABS late model to fit with my non-abs early model and the 2 piston- calipers. I say 4-wheel ABS because then the front drivers side doesnt have that weird T-block, it fits just like the non t-block I have in the 2wd 88. 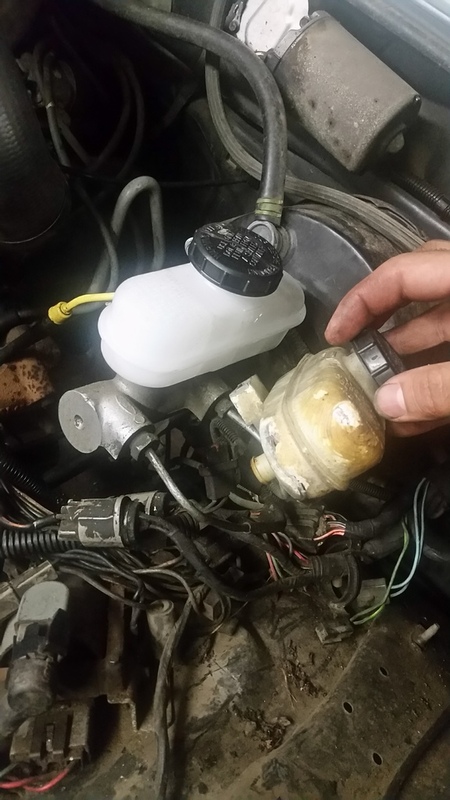 Replaced the old dry rotted brake reservoir as well. May still pull the master and clean up and repaint the booster later. 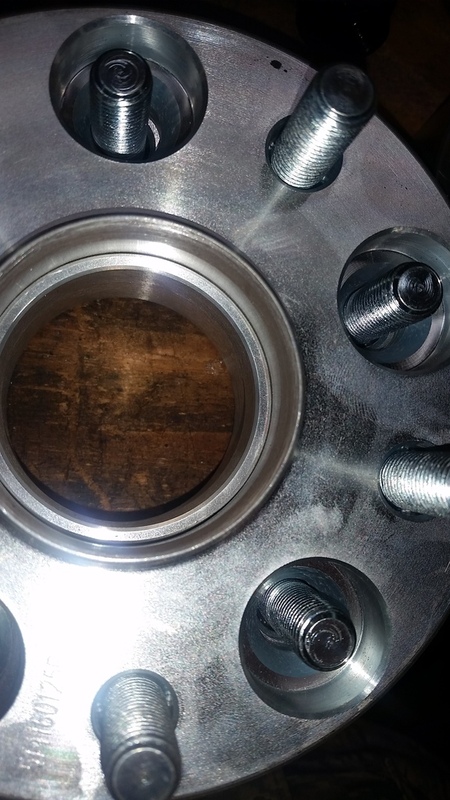 Then once the knuckles were on i machined down the hubs and spacers to fit the front wheels. 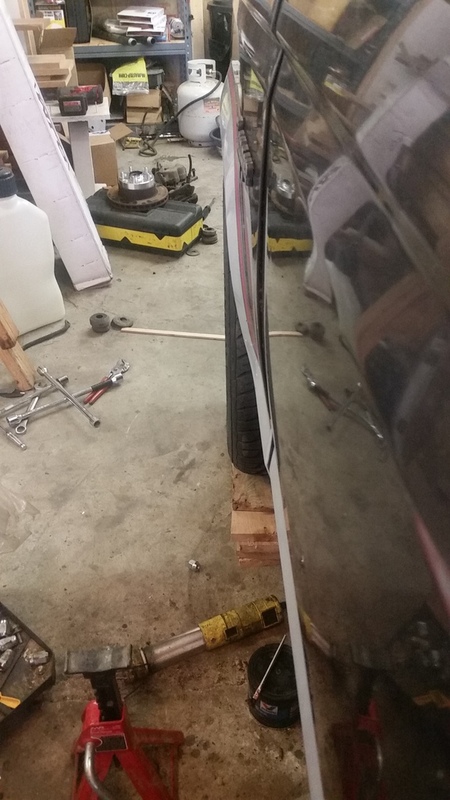 Fits pretty spot on but still need to align when my 4deg cams come in and i may be able to get away without rolling the front fenders, but we shall see. 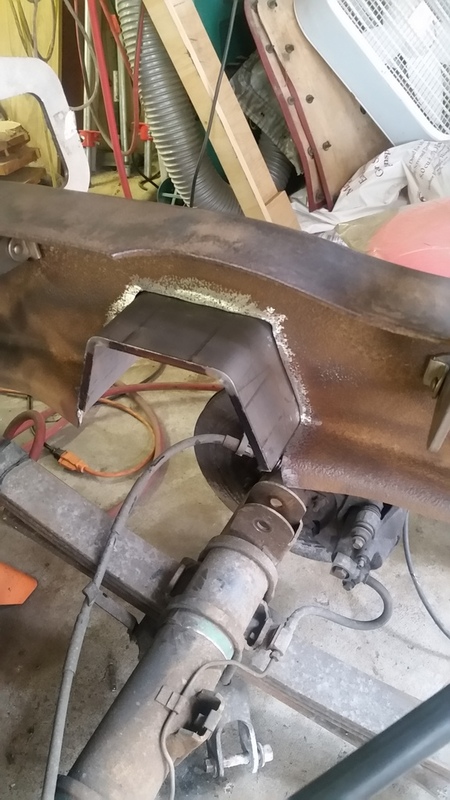 Thats where i stopped at the time as i was waiting on parts for the front, so i moved on to C notching the rear. 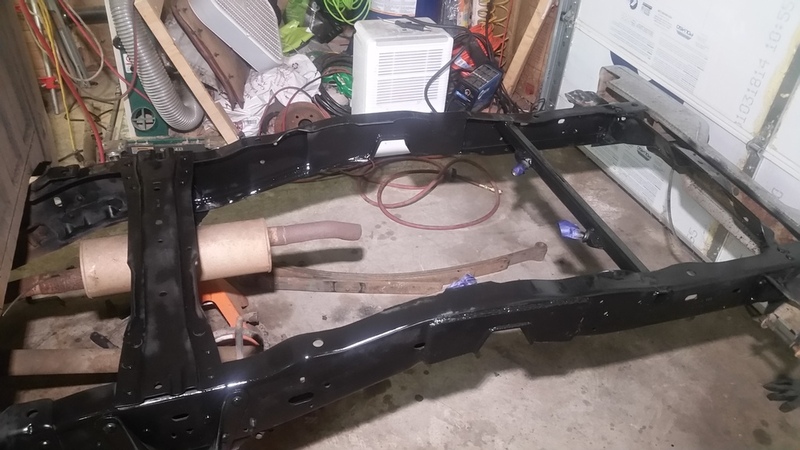 Due to the frame there is a 1/2" gap at the bottom so i will be boxing it in with 1/4" plate as well as the back side with 3/16". 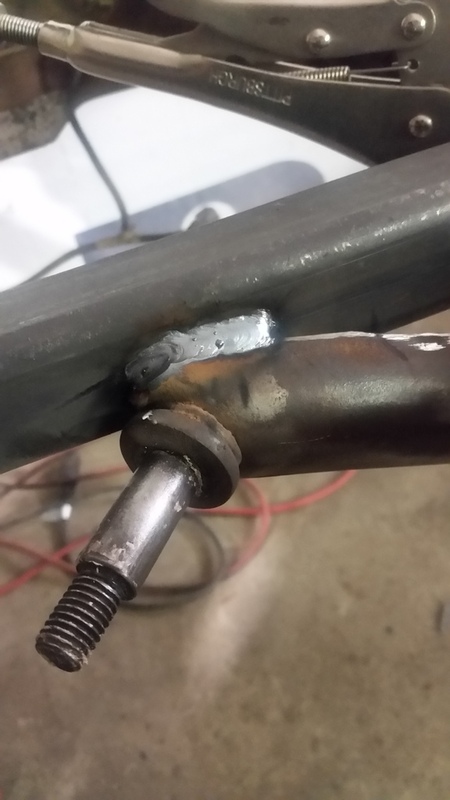 I was playing with some settings on the MIG on this first one so its not what id like to see but its more than functional and I will finish the rest of the boxing when my new c25 tank comes in. 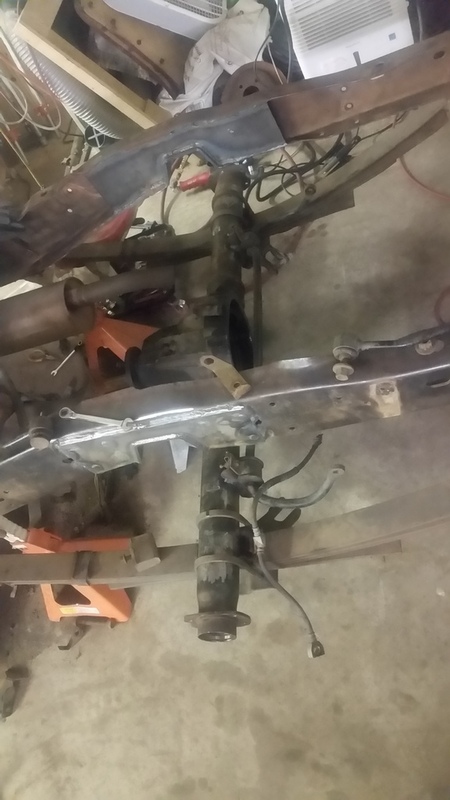 Once i got both C-notches in I wanted to start on the axle. so started tearing it down to shorten. 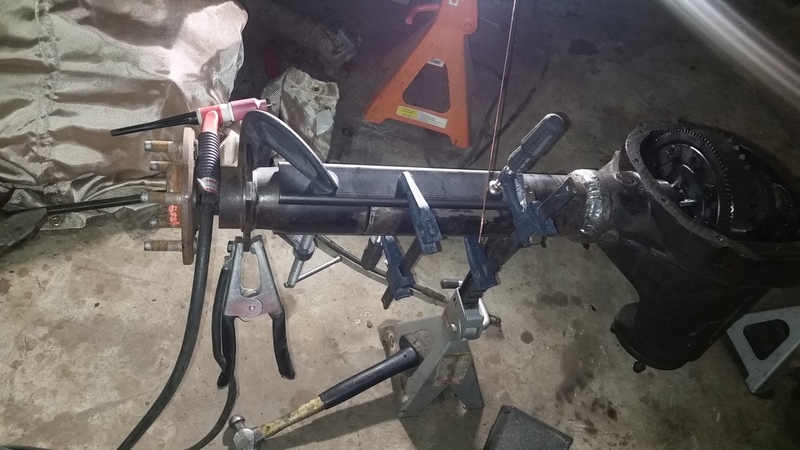 And after i got all the brackets cut off and fixed minor nicks on the axle tubes i determined i need different gas in my MIG welder to do it right at this point so I stopped after i cut the axle and started the mock up. So i need to wait till i get a new gas bottle or come back this week and finish it with my TIG. 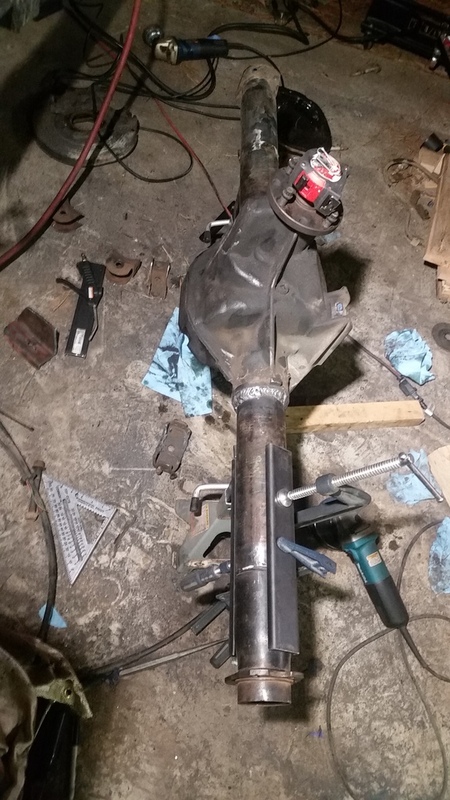 Still need to do final mock up by putting the diff and axle in to verify but its ready to weld up. 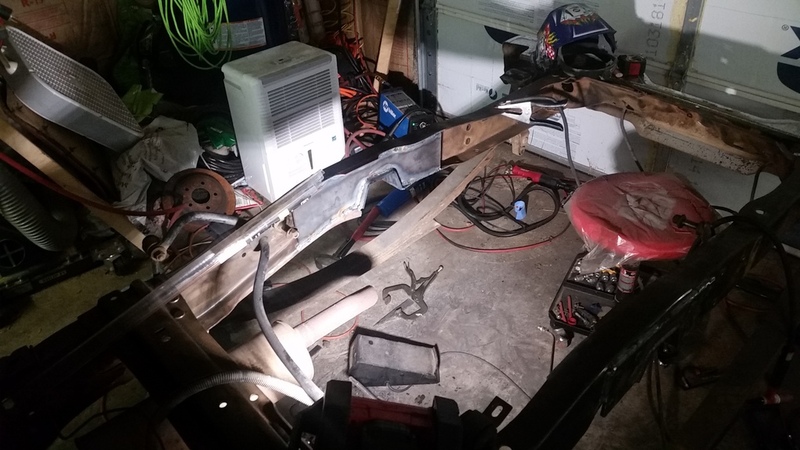 Well another weekend comes and goes too quickly, but after getting it realigned and the TIG setup i had just enough gas to tack and then finish welding up all the mounts on the axle housing and the final welds on the boxed frame underneath. 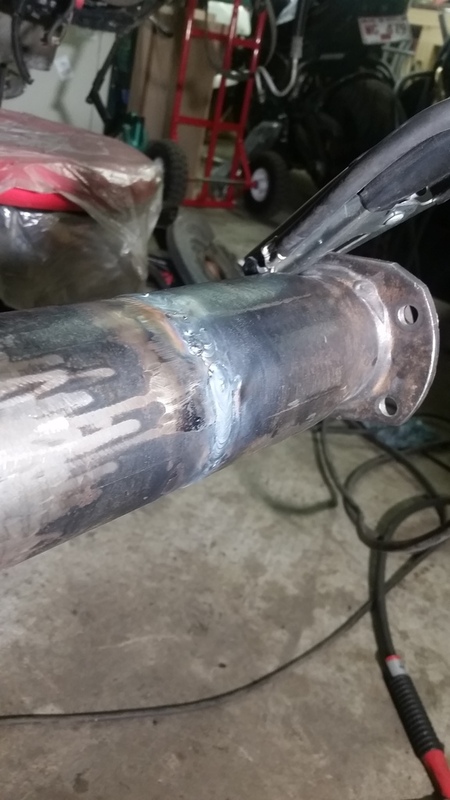 And went back over the mig welds as they had issues.... used the TIG to pull out all the impurities and bubbles. 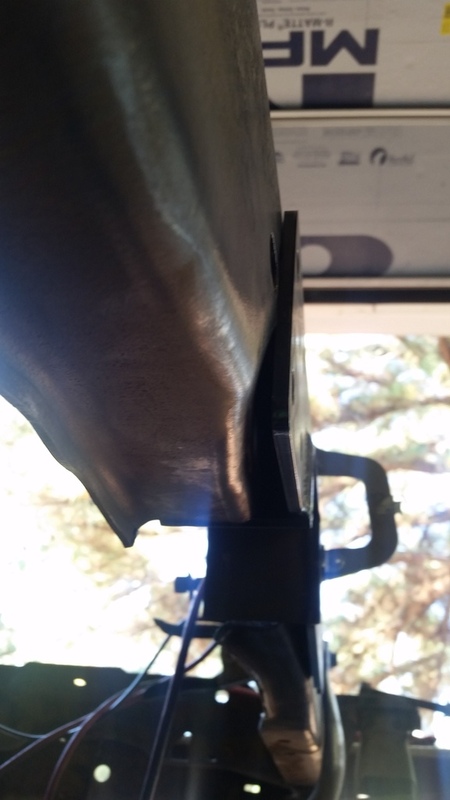 And the spring perches and sway bar mounts are stuck to the housing. 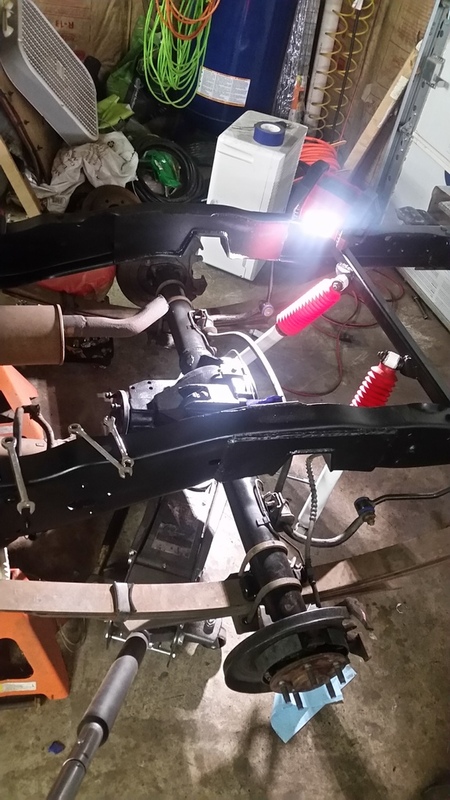 Hope adding the sway bar back in helps in the handling dept. the old 7.5 didnt have one. 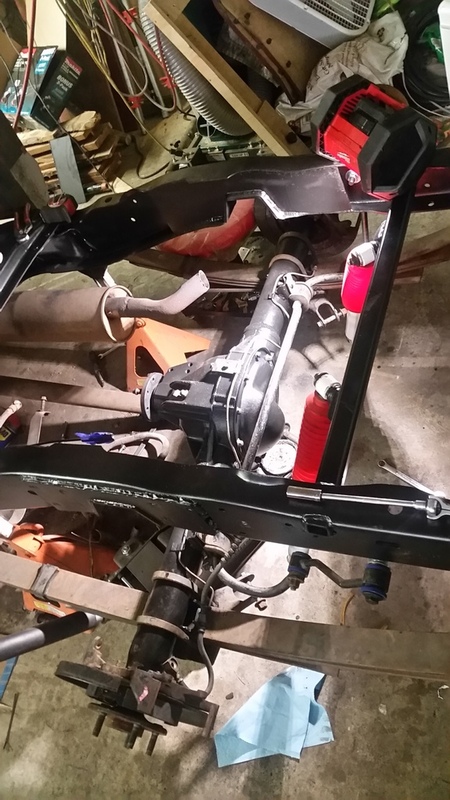 And last but not least finally mocked up to get all the hoses and sway bar mounts aligned and final mount tabs installed before paint and rebuild the rear with new bearings and seals. I wanted to have it down and on the ground at the end of this weekend but alas that didnt happen as usual. 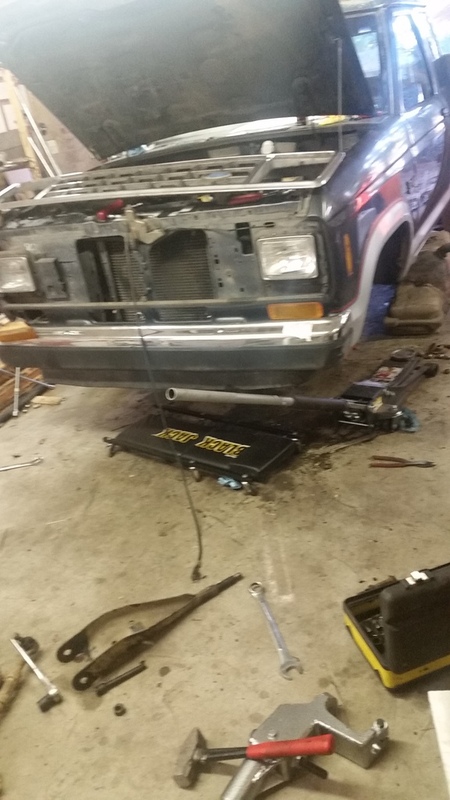 Im waiting on some steel tube to come in to relocate the upper shock mounts as im using the explorer lowers which locate the shocks at about a 45 deg angle to the axle. 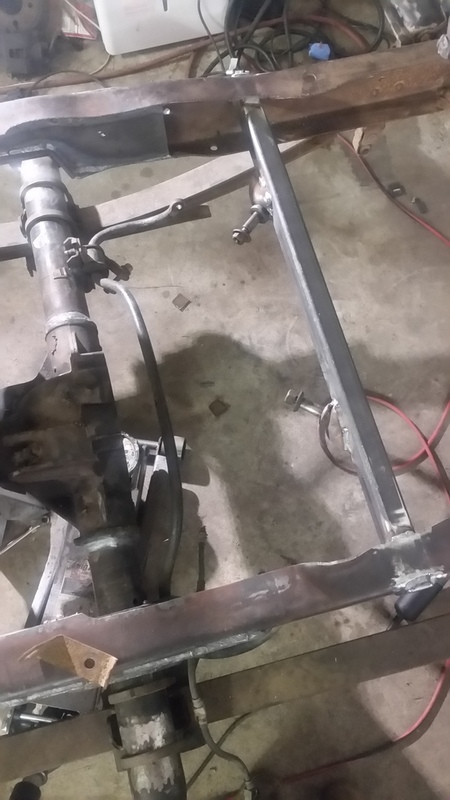 After that bar comes in ill weld the old upper mounts to it and weld it into the frame. Then Ill do some final light frame cleanup and rattle can paint. I just need more time in the day to do this stuff during the week. Ok finished up the last bit of fab this weekend. Here I was mocking up the new shock upper mounts. 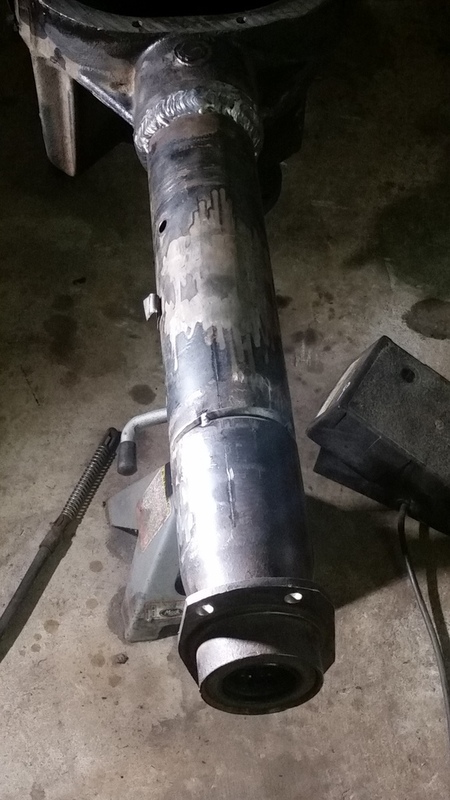 welded in a 3/16"X1 1/2" Bar across then hacked up the stock shock mounts and welded them in. 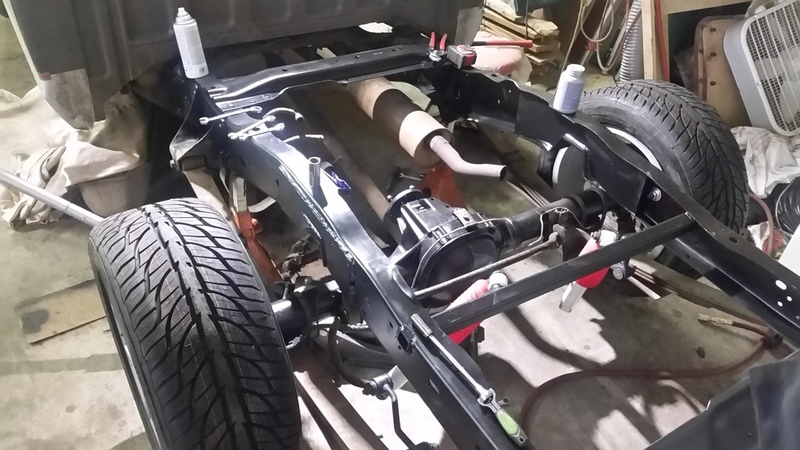 This seemes good with the lowering shocks I have however they are now short I believe on the extension side once the axle has all the weight in it from diff, axle, brakes, tires.... May have to get longer. Ill wait till i get it back on the ground and the beds on to determine that. I think the explorer springs are a bit heavy right now so i may need to remove a leaf or figure out a different spring to get the drop i want. 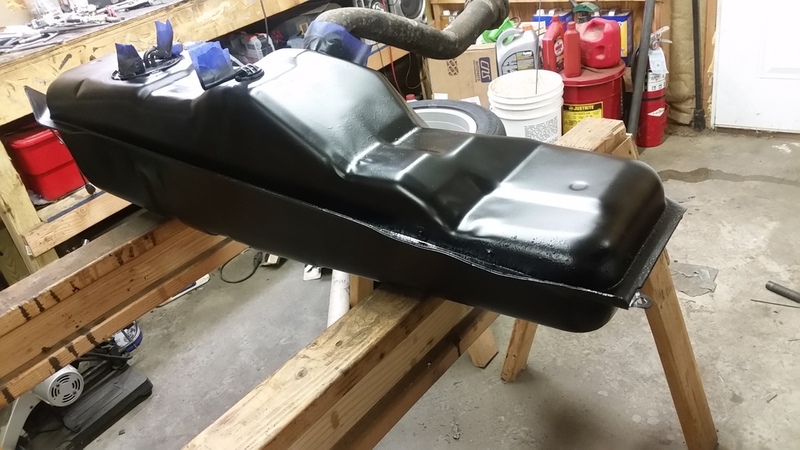 Then it was time to rattle can a little paint. 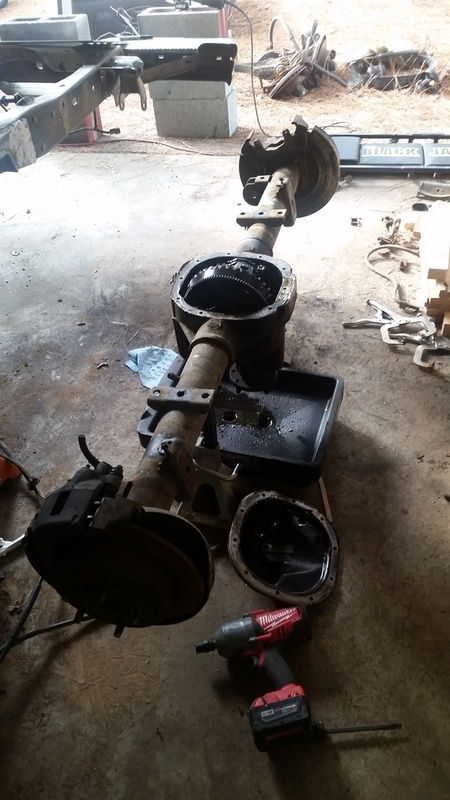 After that it wastime to reassemble the axle and start getting this thing rolling. 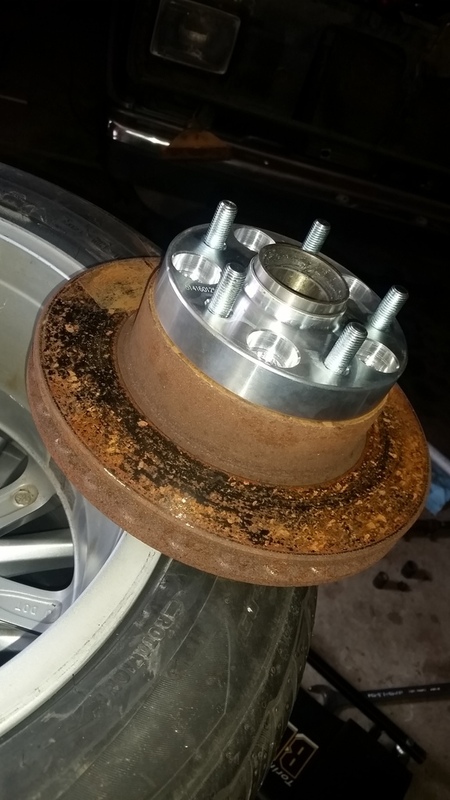 New bearings, seals, E brake shoes as you can see these were probably original. 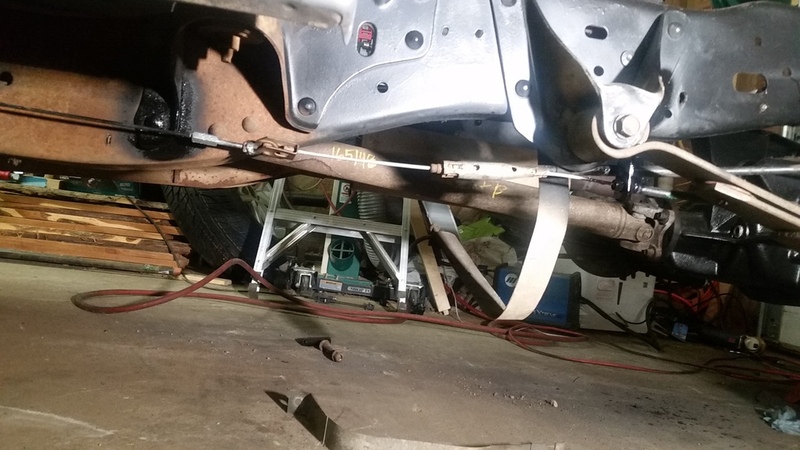 And getting the sway bar on and mocking shocks. 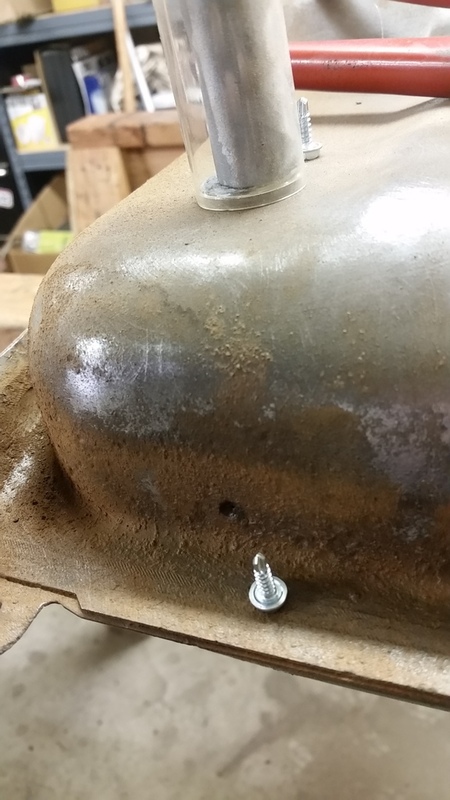 Sealing up the diff cover. And just because i machined my rear spacers to mock the wheels. And thats where i called it quits yesterday. 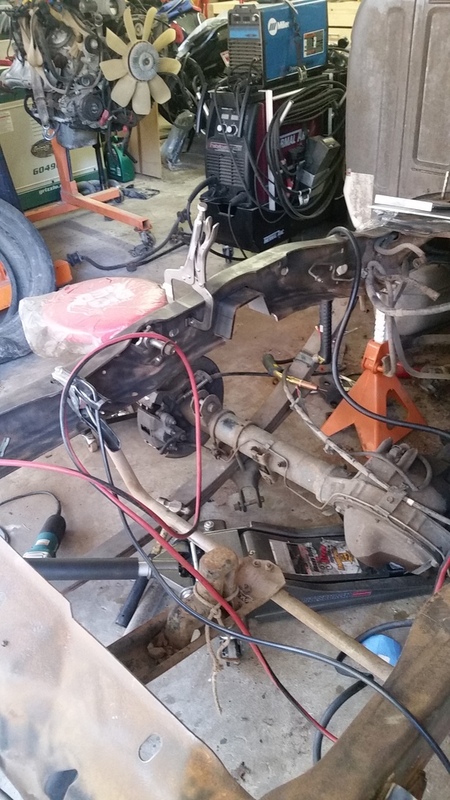 Still need to mount all the brake calipers and add a small section of line as the stock is about 6" short now. I was gonna knock it all out but i figured now would be a good time to paint all the calipers as theres no fluid in them currently. 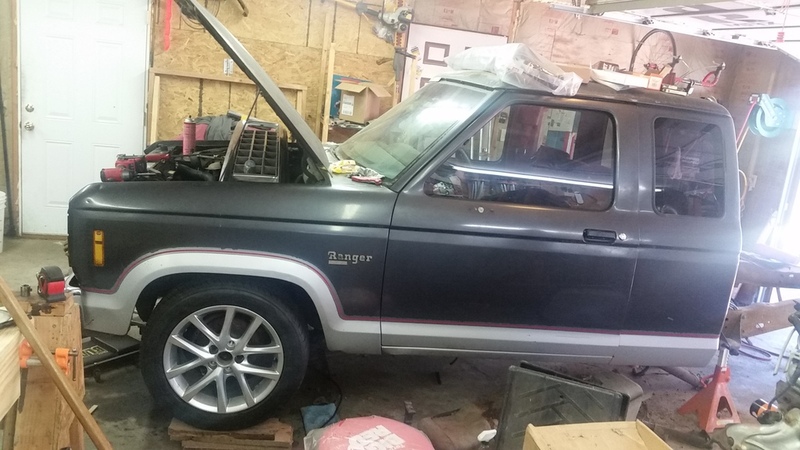 So all in all this build is taking way longer than id anticipated due to all the cleaning, painting, re lubeing, and anti siezing every thing since 28 yrs leaves everything pretty bone dry of lube. I kept my brake lines set up like how a Ranger is. 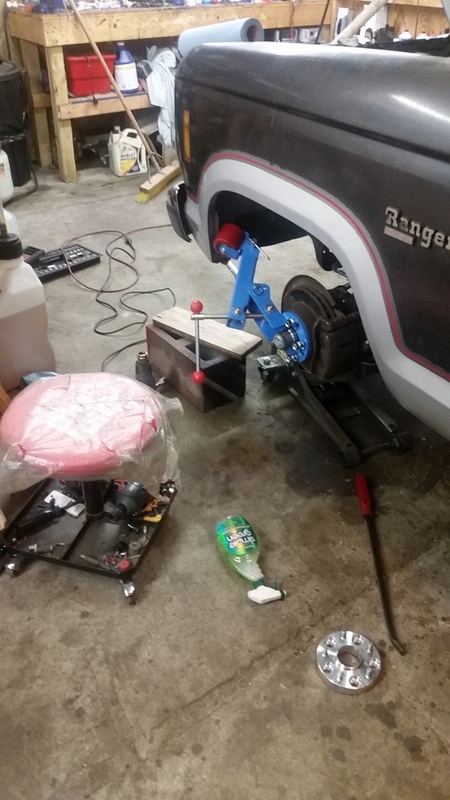 I got two new passenger side softlines, added mounts to both to my aftermarket perches and put the Ranger splitter block on top the diff as it was on the 7.5. I would post pics but photobucket crashes my firefox both times I have tried it today. I'm opting to keep the explorer setup and just tack on the line mount to the left rail. Only thing I'll really have to do is add a short run of line. I'm assuming you did the disk conversion too? 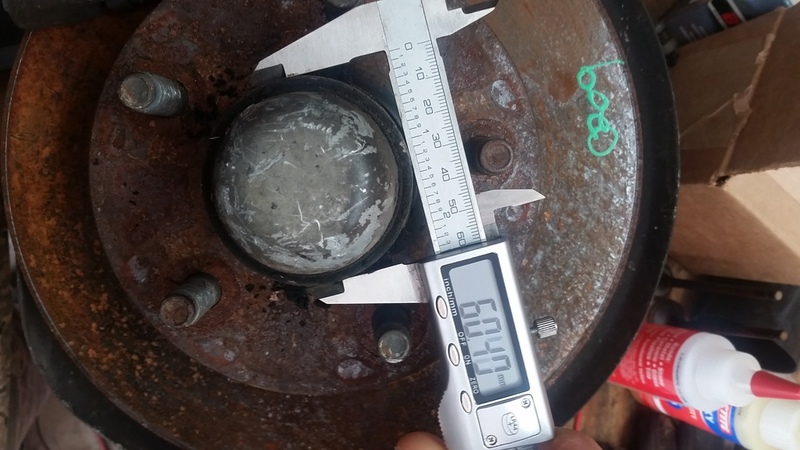 Yeah, 8.8 out of a '96. 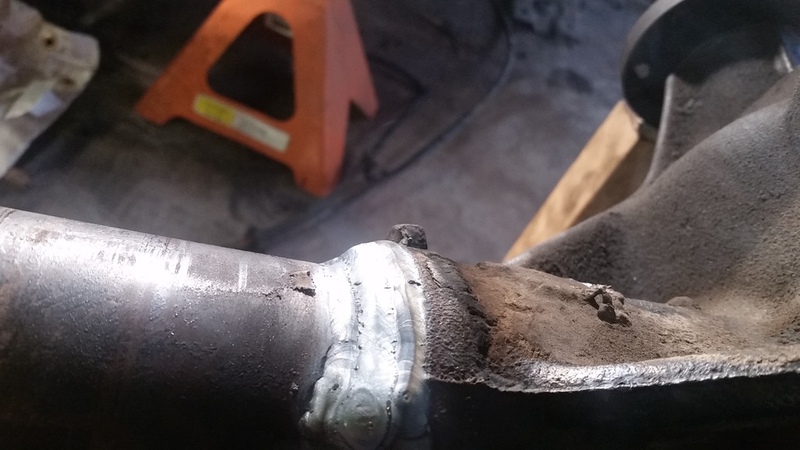 Made the 6" extension for the rear brake line and got everything bleed and all the old im sure original sludge out of all the lines. 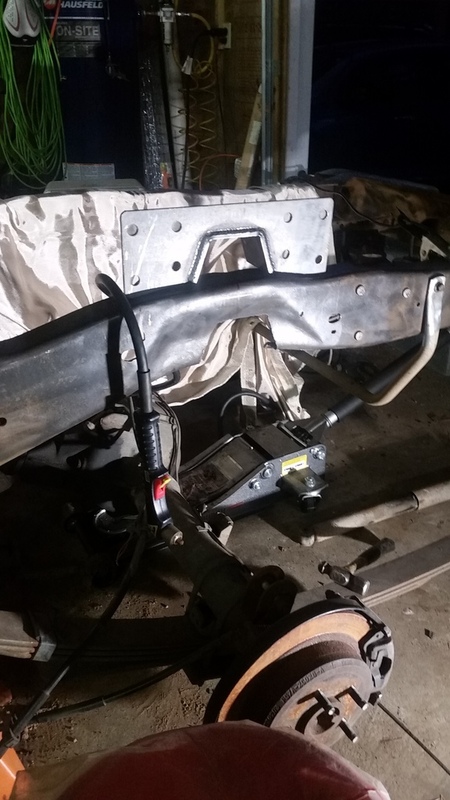 At this point i realized it wasnt going to sit at the height i wanted so i flipped the rear shackle mounts and picked up belltech springs. Then It was time to get the E-brake setup. 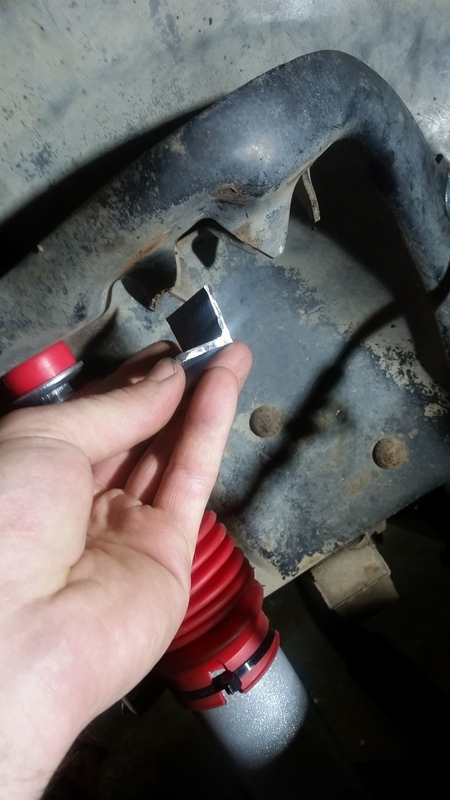 and the ranger to explorer wasnt going to work out of the box so I ended up modding the ranger cable hookup and gettting a VW baja bug E brake adapter/adjuster. And after waaaayyy too much time and 3 different setups I finally got it to a spot that works and allows future wider tire upgrades. 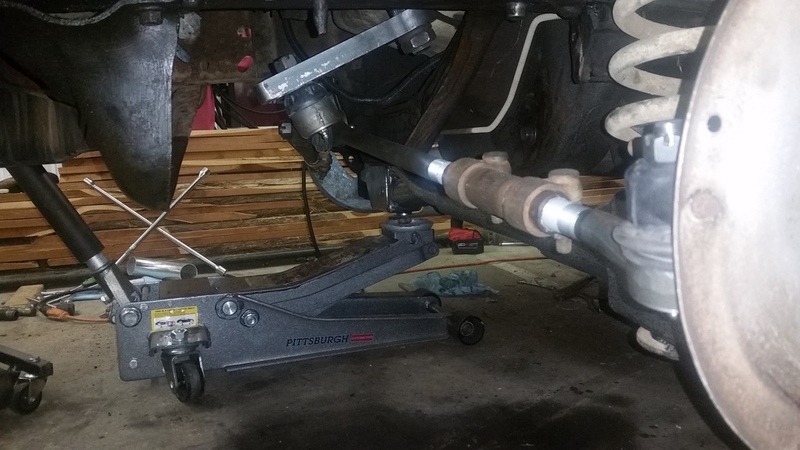 Then it was back to the front suspension to install the Belltech springs but because they are shorter I had to fix the retention tab on the passsenger side so the spring wont fall out on the unlikelyhood of full extension. 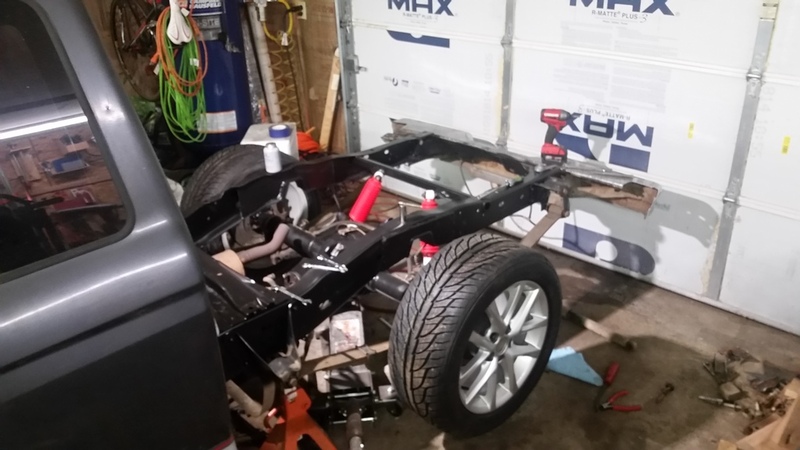 And then to get the wheels to fit i had to roll the fenders. If i did it again id probably get 225 tires and a slightly smaller spacer. I dont really think square wheel arches are really the greatest to roll. 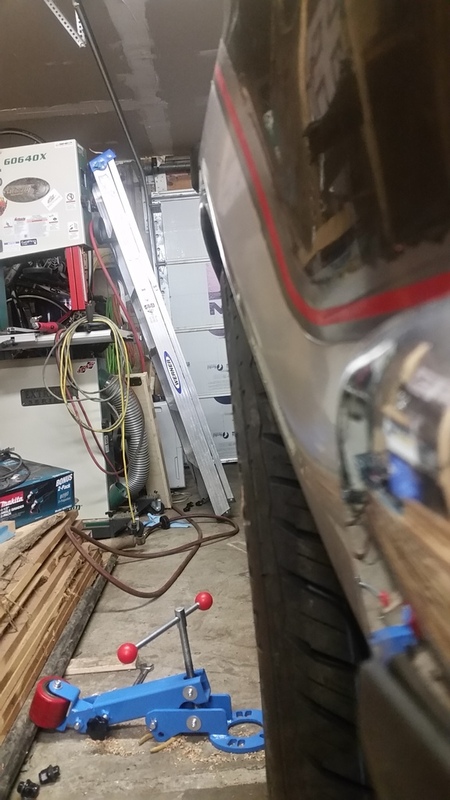 But it worked, I still need to trim and shift the fender liner yet. And then it was time to put the gas tank back in but I found 3 pinholes when cleaning it up and painting so needed to fix those. 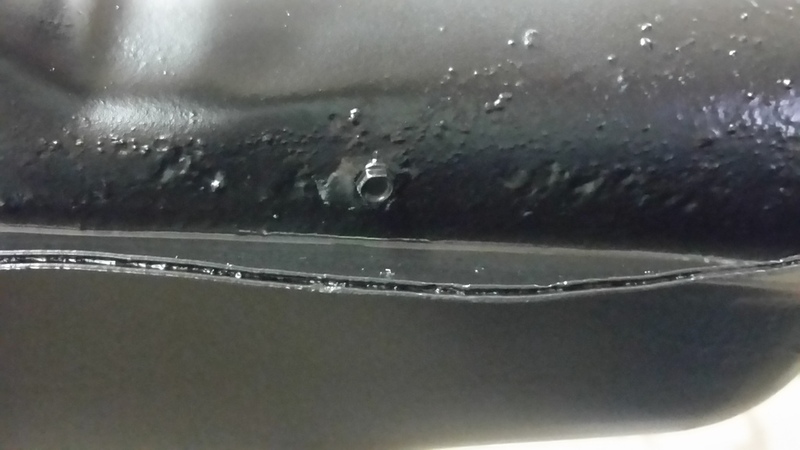 Since the surroundong metal is still good and they are just pin holes I used a self tapper sheet metal screw through JB weld as a sealant. Good for pinholes, if it was any worse id have gotten a fuel cell. But as long as this holds Ill keep it and add fuel pumps and a swirl tank later, could save the cost of a fuel cell. 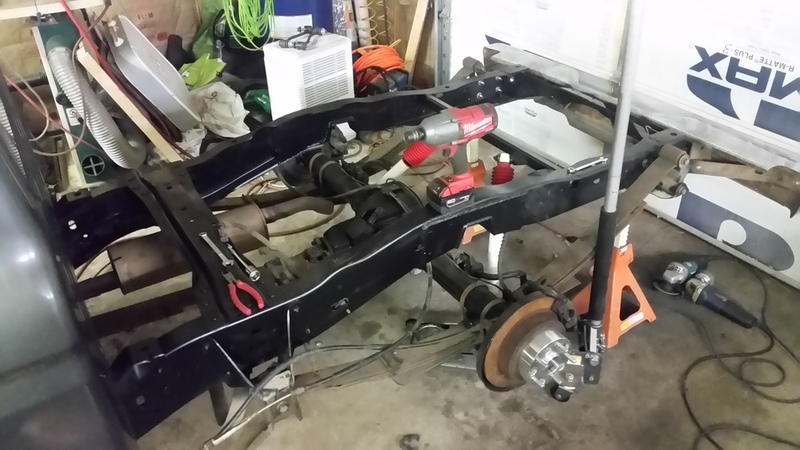 Hope to get the bed on later today and roll the rear fenders. Get a good side stance shot. 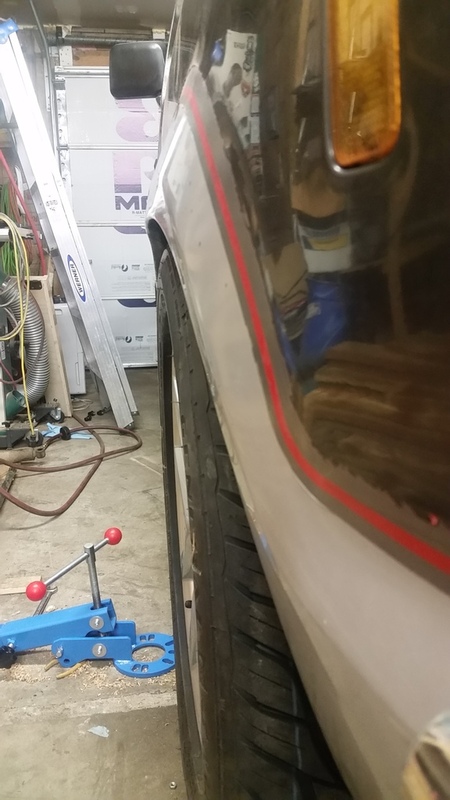 Also finish the alignment, I got the camber to about -1 deg but still need to get toe and steering aligned. 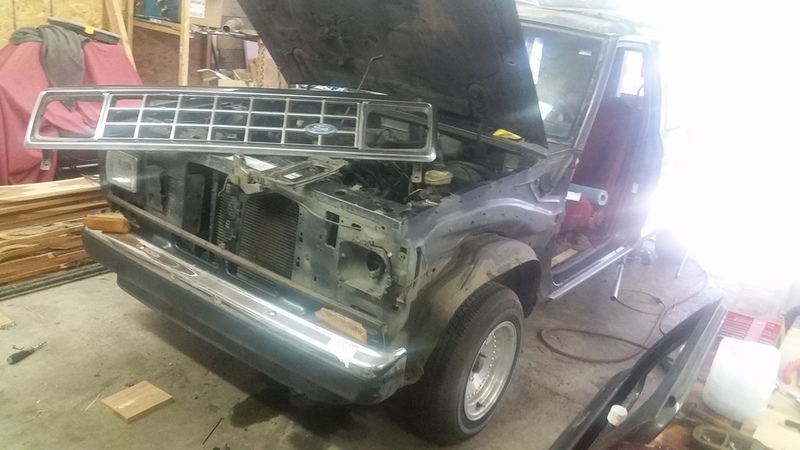 Hoping to get that and then remove windshield to get the cab re seam sealed and schedule new window install this week. should be able to start driving it after that! Then all smaller tasks, interior, dash, getting the rest of the parts for the LM7 swap etc. 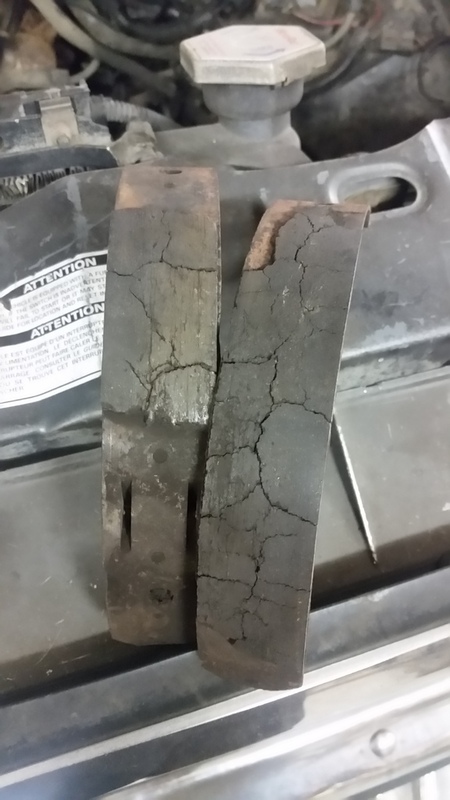 Maybe get the roll pan on early spring. 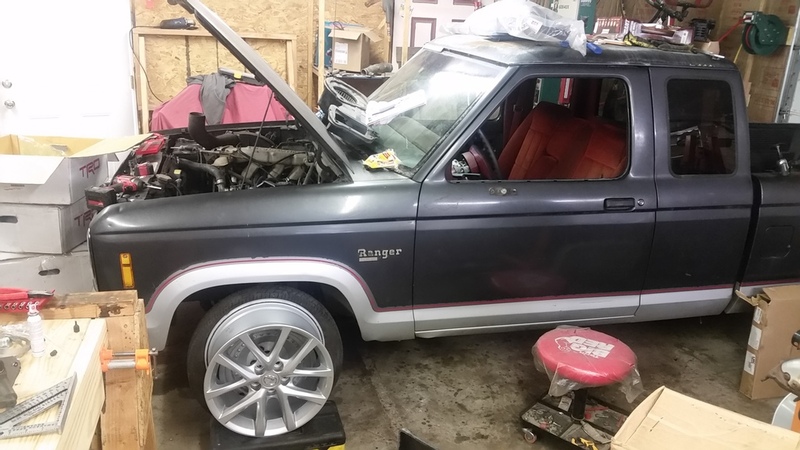 I dont plan to do the engine swap till late summer/fall time frame.